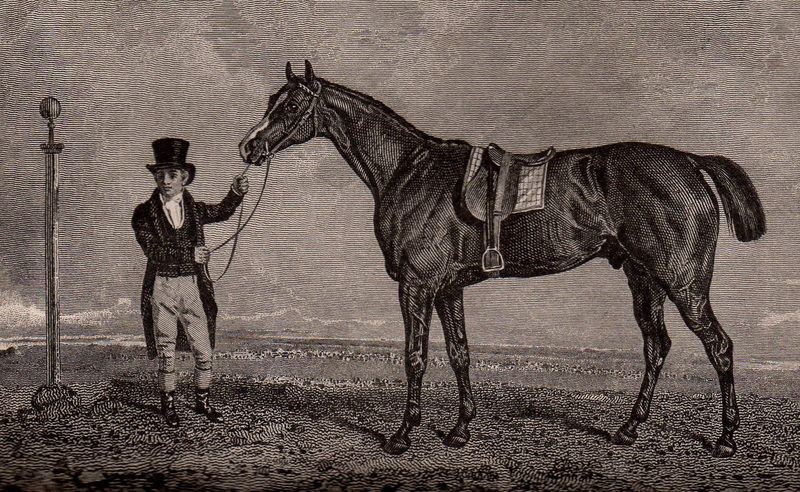 This was run on Thursday 19th May 1825 and the winner was bred by the 5th Earl of Jersey and trained by James Edwards. There were 18 runners from an initial entry of 58, the winner winning by 2 lengths to claim a first prize of £1,995, (The equivalent of £177,240 in today's terms based on Bank of England inflation calculator). The Ante-Post market shown below does not even mention Middleton as a potential runner, but this is not surprising since the horse had never run in public before and won the Derby in his one and only race. Despite this he started 7/4 favourite for the race and, in truth, probably had only one serious opponent. Furthermore, it was thought that he had been 'got at' when the boy attending to him allowed the horse to drink copious amounts of water. In the race itself the two principals raced cleared and it was only in the final 50 yards that Jem Robinson urged Middleton on to claim a 2 length victory. 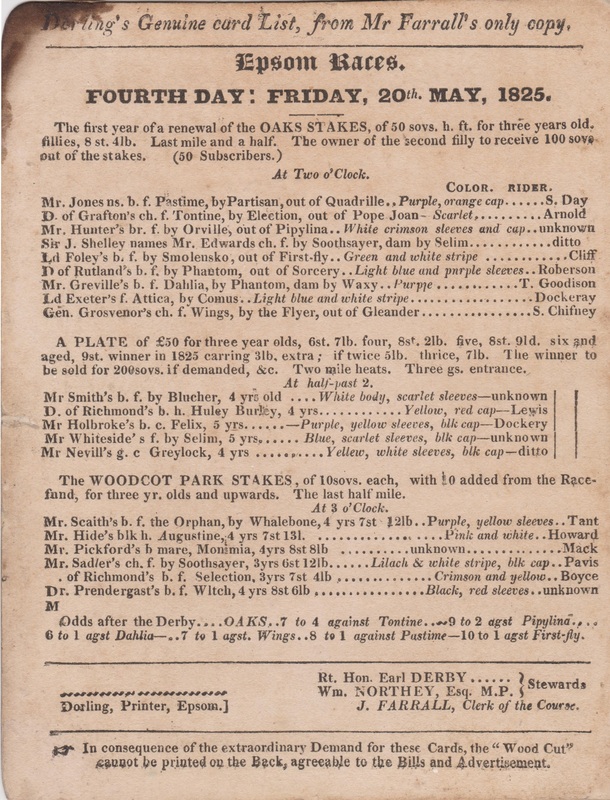 I am extremely grateful to David Rice for the scan of the very rare Oaks Racecard from 1825. This forms part of his impressive collection of Horse racing memorabilia. He notes that the card contains a few inaccuracies and doesn't list the The Brownie as a participant. It also says that the winner Wings is out of Gleander instead of Oleander. It mentions THE WOODCOT PARK STAKES instead of what should be the WOOD PARK STAKES according to the Racing Calendar. There are other minor discrepancies too on the racecard when compared to the Racing Calendar. What is particularly interesting is the date of the racecard, for it was previously believed that the first Dorling's card was not issued until 1827.